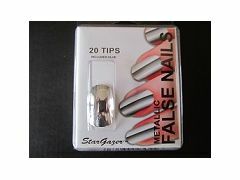 Stargazer's range of metallic & glitter false nails are available in Gold, Silver & Pink shades. Each box contains approx 20 nail tips so that you can find the best sizes to suit your nails. The nails are easy to apply with the professional salon formula of clear nail glue, which is also included in the box. Whether you are looking for a sparkling glitter effect, or a striking metallic chrome effect, this range has something to suit in a range of classic colours.